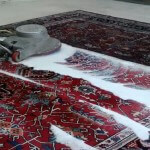 At Persia oriental, our rug cleaning process is to use the most effective yet simple cleaning methods possible. We stick with dye-free, perfume-free soaps; pure, clean water, and quick and efficient drying. Minimizing the strain on the rug during the process. We have over 30 years of experience caring for and cleaning oriental rugs, and we have developed a method to give your rug the highest quality clean, while protecting its integrity. Here are the typical steps we take to ensure that your oriental rug is fully cleaned and well taken care of. 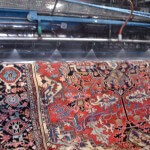 First, each rug is thoroughly inspected and assessed based on its cleaning needs and current condition. Any special requests or special concerns by the customer are acknowledged. Your Oriental Rug is photographed in detail in order to document the pre-cleansed state of the rug. Rug fibers are inspected by digital microscope to ensure their health and identify pollutants. Our unique dust removal process initiates the cleaning process and begins to remove debris. Air suction filtration prevents the transfer of any particles during the dust removal process. The water used to clean the rug is first micro-filtered and softened to industry standards in order to ensure a gentle cleanse. Our custom wash system is adjusted according to the rugs thickness and pile to create an appropriate cleanse. Accurate pressure is applied by soft, circular brushes across the entire width of the rug. Synchronized cleaning and rinsing reduces excessive exposure to water. Rug Fringe is always hand washed, ensuring delicate and careful cleanse. At Persia Oriental, our rug drying methods are so efficient that 90% of the water is removed in just minutes, minimizing the water exposure and protecting the rug’s fibers. A pressure controlled combing device then brushes the entire surface of the rug. The combing device always moves in the same direction as the pile which restores the rugs luster. The final step in the drying process takes place in one of our custom drying rooms, equipped to eradicate mold, prevent dust collection, and remove remaining moisture. No rug cleaning is complete without an inspection done by hand to check that the cleanse was thorough. Extra hand washing may be done to ensure that all the fringes of the rug are completely clean. Any repairs requested by the customer will be addressed and made to the customers exact request. If repairs needed are extensive, the rug will be transported to our expert repair department for evaluation . The newly cleaned rug is again photographed in detail to record the final condition. Tightly controlled brushes comb over the surface to give the rug a final reconditioning. 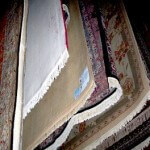 Finally your rug is readied for its return home by our careful handed team of professionals.